Being reliable by means of providing secured payment methods on Ecommerce store is must in order to build trust with customers. Magento 2 HDFC Payment Gateway extension by MageComp integrates HDFC payment gateway with Magento in order to capture secured payments for customers’ orders on your stores. Customers are redirected to HDFC payment gateway to enter credit card details and payment completion rather collecting it on site and thus the extension facilitates building trust. 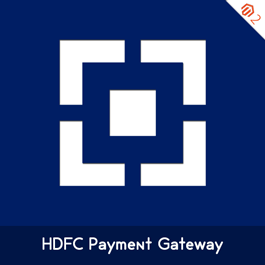 Note: Right now we have integrated HDFC payment gateway with FSS payments. Why choose MageComp’s Magento 2 HDFC Payment Gateway extension: •	Capture encrypted payment data to collect payments. •	Custom title to show HDFC payment method on frontend.